More at NOAA National Weather Service. There were 112 hotels reported in Manhattan, by the way. 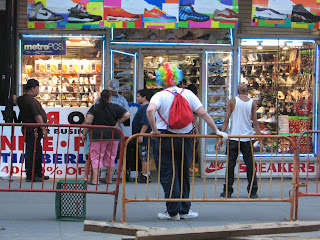 The Sneaker Spot Clown takes a break in front of the shoes etc. 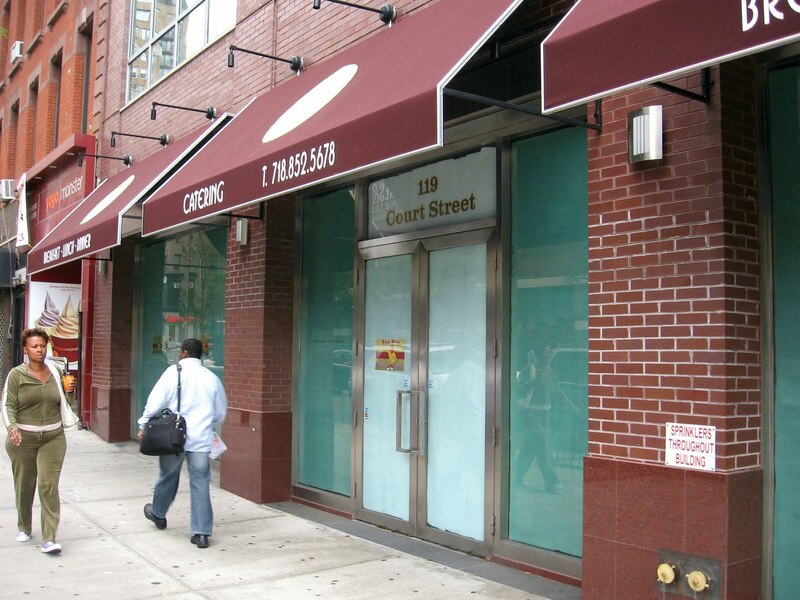 store at 519 Fulton Street in Downtown Brooklyn. Yelp commenters don't exactly love the place. Maybe the clown is a way to keep 'em laughing. Millions of children who survived the floods in Pakistan are now vulnerable to a second wave of death caused by waterborne disease. Save the Children has staff in the region and is mobilizing to aid displaced children and families who need essential supplies. If you want to help these desperate children and families, give now Save the Children's Pakistan Children in Emergency Fund. Fortune spent two months digging inside the mysterious world of Trader Joe's (whose management is said to be "obsessively secretive"). Fortune's Beth Kowitt spoke with former executives, competitors, industry analysts, and suppliers, most of whom asked not to be named. 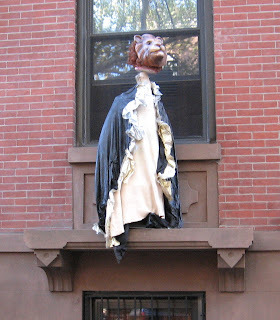 Brooklynites are crazy about their Cobble Hill TJs. 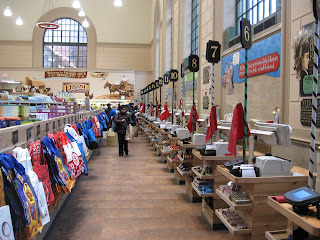 Read here to see behind the Trader Joe's veil. When you have a quiet five minutes with no distractions, enlarge this video so it fills the screen and turn on your speakers. Then get comfortable and watch some of the earliest color motion pictures that you will ever see. This magical clip, put together by Kodak, was a test of Kodachrome color motion picture film from 1922, shot with a hand-cranked camera. The first full length color feature film did not appear until 13-years later. Read more about this at Gothamist. This footage is from the George Eastman House collections. Preservation was completed by the museum's Motion Picture Department, a project of Sabrina Negri, a student in Eastman House's L. Jeffrey Selznick School of Film Preservation and a recipient of the Haghefilm Foundation Fellowship. More information can be found at 1000words. Brooklyn Bridge Park Corp. (BBPC) Wednesday announced it is seeking proposals for "the rehabilitation and adaptive reuse of the former Tobacco Warehouse on the waterfront in DUMBO,"according to the Brooklyn Eagle. BBPC is seeking applicants "who are interested in leasing, redeveloping and being the primary user of the site as a cultural or educational facility with community uses." 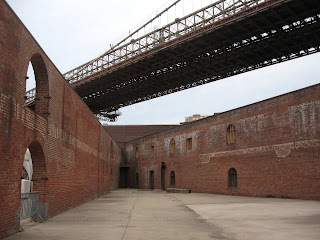 The roofless warehouse has almost iconic status in DUMBO. 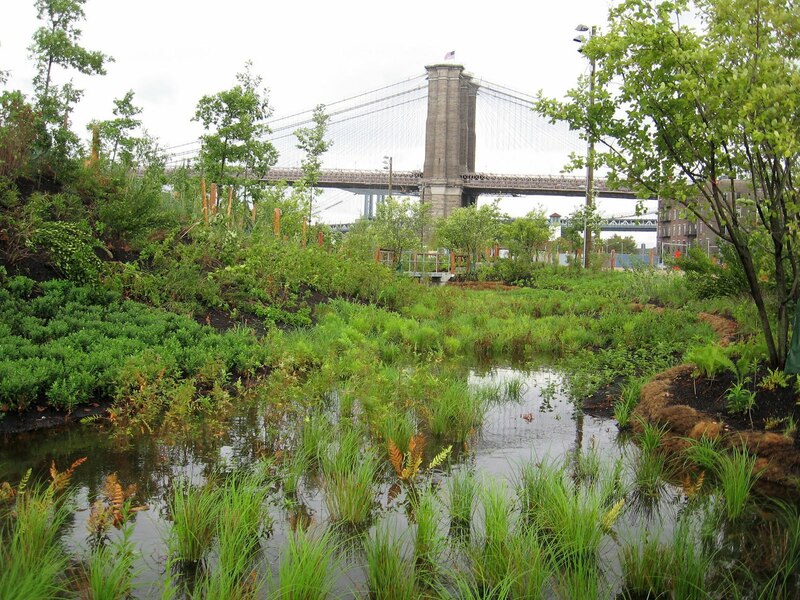 The city has recently opted to open up the bidding to "for-group" companies as opposed to just non-profits, according to the NY Post, meaning that on-site revenues raised could go towards maintaining the park as opposed to just maintaining the warehouse. Two cars smashed into each other sending one flying into a building and the other hurtling down Henry Street in Brooklyn Heights this afternoon. The car above crashed thunderously into 30 Henry Street, the offices of the Brooklyn Eagle newspaper. The driver (seen sitting with a brace around his neck) appeared to be in better shape than the driver of the car below, who was carried away in great pain. The noise was tremendous. Reporters from the Brooklyn Eagle rushed out of the building with cameras and firefighters came running from the firehouse just around the corner. The full story appears here. Luckily, school is still out for the summer, as this corner would normally be crowded with kids and parents walking home from P.S. 8 at this time of day. They specialize in Latin dishes featuring chicken with sides like yucca, platanos, rice and beans, but ther menu is quite large. There's another Tio Peo on Willoughby Street between Lawrence and Bridge, which has favorable reviews on Yelp. "Cheap and delicious." There were 17 customers in Starbucks on Montague Street in Brooklyn Heights at 2 p.m. yesterday afternoon. Of these, 11 were working on Apple computers. One was working on a Dell. Have you been feeling a bit unbalanced lately? Maybe it's because some jerk pried the two-fish Pisces symbol off the armillary sundial at the north end of the Brooklyn Heights Promenade. (Well they didn't just swim away, did they?) 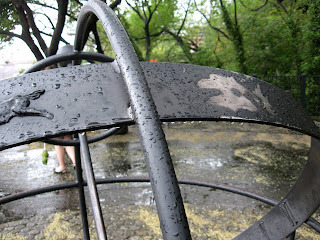 The light areas in the photo above show where the Pisces had its place in the Zodiac ringing the wrought-iron sundial. Obviously, this has been disrupting the karma of the entire Promenade. 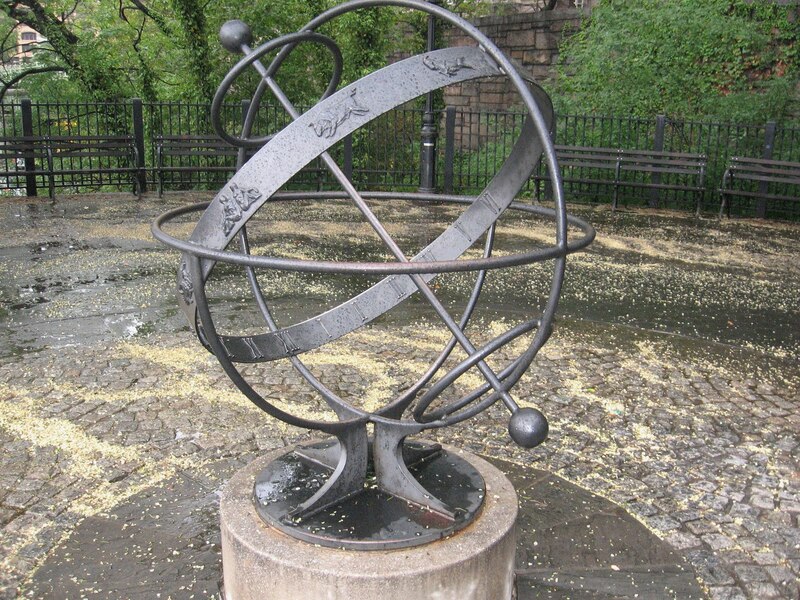 The armillary needs to be restored to its former glory so Brooklyn Heights can regain its balance. Which one is just right? 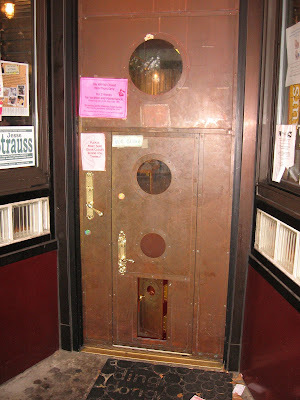 Look carefully and you'll see that the entrance of The Moxie Spot diner on Atlantic Avenue in Brooklyn Heights has an adult-sized door, a kid-sized door and an adorable wee tiny door (doll-sized? Elf-sized?) all nested inside each other. 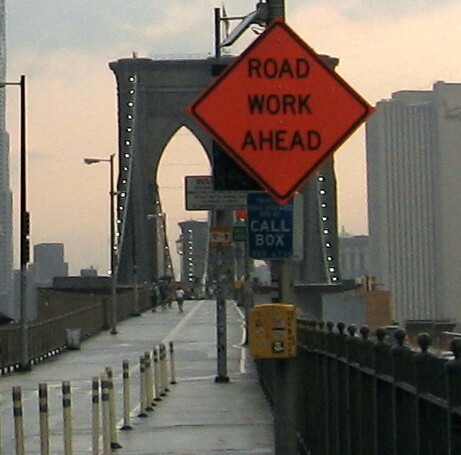 Reminder: All Manhattan-bound lanes of the Brooklyn Bridge will be closed at night beginning tonight -- August 23 -- continuing until 2014. On top of this, there will be up to 24 weekends when the Manhattan-bound lanes will be closed all weekend. 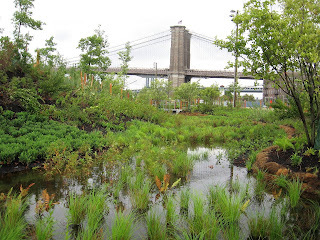 A small oasis in Brooklyn Bridge Park. Did you ever stand at the south edge of the Brooklyn Heights Promenade at night and watch the never-ending stream of cars drive underneath? Eventually the fumes will kill you, but there's still something hypnotic about it. Campers from Camp Simcha and their counselors gathered in Cadman Plaza Park in Brooklyn Heights Wednesday evening for a celebration and a speech from Mayor Michael Bloomberg. 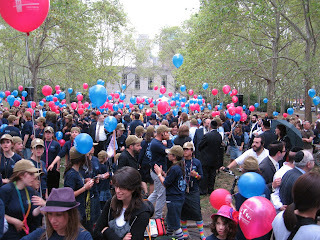 Then they marched over the Brooklyn Bridge and let off hundreds of ballons signifying their hope for the future. Camp Simcha is a special summer camp in upstate New York for Jewish children with cancer and related diseases. There they can go swimming, play sports and have the same good times other kids have. 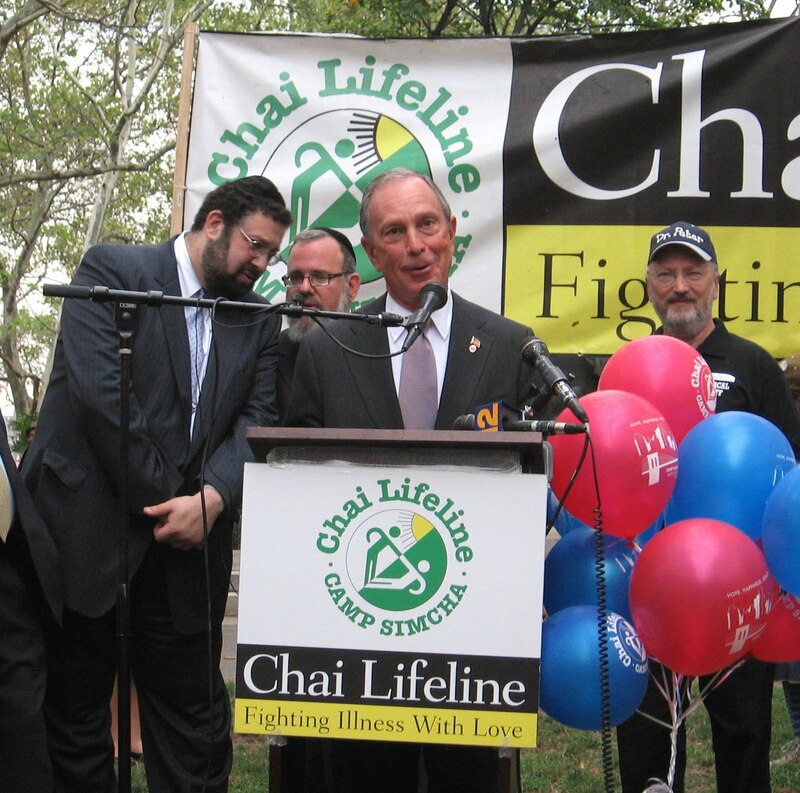 Mayor Bloomberg welcomed the campers and proclaimed them to be official New Yorkers. 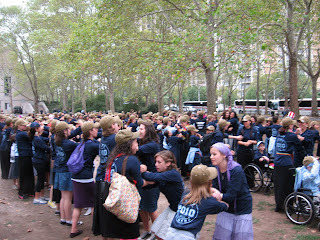 Campers danced for the Mayor to the tune of "King of New York" before setting off over the bridge. Thor Equities has begun demolition work on Coney Island’s historic Henderson Music Hall building, "apparently without receiving any permits and without taking appropriate safety measures," Save Coney Island says. "Workers were seen and photographed (above ) Monday August 16 on the building’s roof using mechanical equipment to remove bricks from the top of the façade of the 1899 Henderson Music Hall, where Harpo Marx made his stage debut with his brothers Groucho and Gummo. 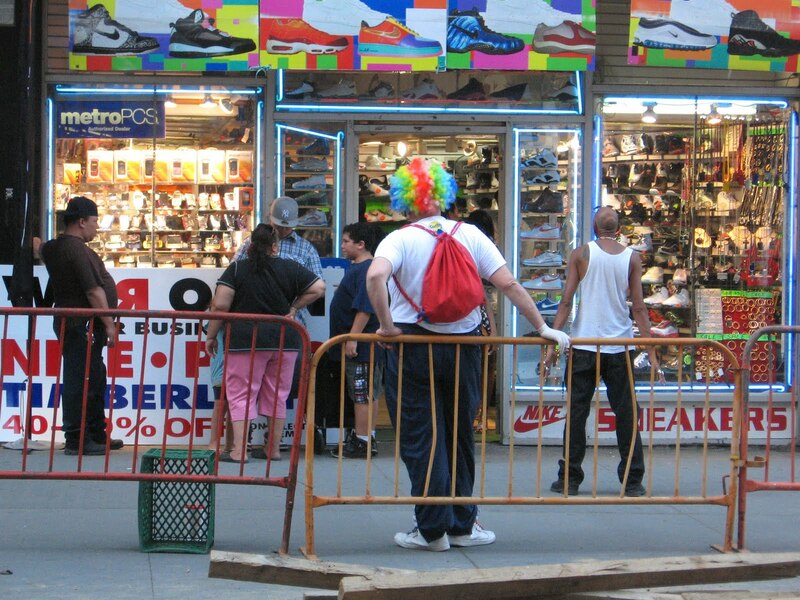 "Moreover, there was no scaffolding or sidewalk shed present to protect pedestrians during the demolition work. "While no permits appear to have been issued for the Henderson Music Hall, Thor did receive demolition permits on Friday, August 13, for two other historic Coney Island buildings: the Bank of Coney Island (a 1923 classical revival building that testifies to Coney’s past prosperity) and the Shore Hotel (built in 1903 and Coney Island’s last operating hotel). “We urge Thor to immediately halt its demolition work and preserve these historic buildings, and we urge the City to make sure that Thor abides by the law,” said Save Coney Island spokesman Juan Rivero. It took 13 years to build it, and now it will take four to fix it. 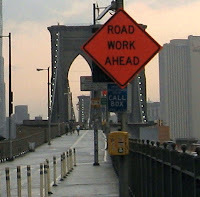 A huge construction project on the Brooklyn Bridge is about to commence, and all Manhattan-bound lanes will be closed every night till 2014, inevitably leading to delays and annoyance. There seems to be no way around the project. Inspections found in 2007 that the bridge was in "poor" shape. 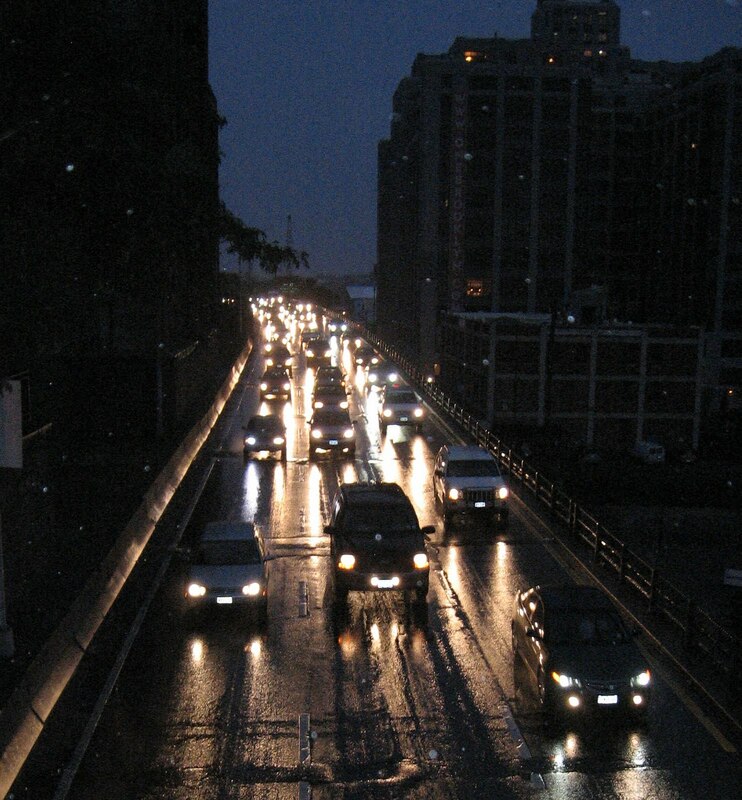 The New York City Department of Transportation is also warning motorists to plan carefully to “avoid the need to enter Manhattan on closure weekends.” Closure weekends are the (up to) 24 weekends that the Manhattan-bound lanes can contractually be closed (all weekend!) while construction is underway. 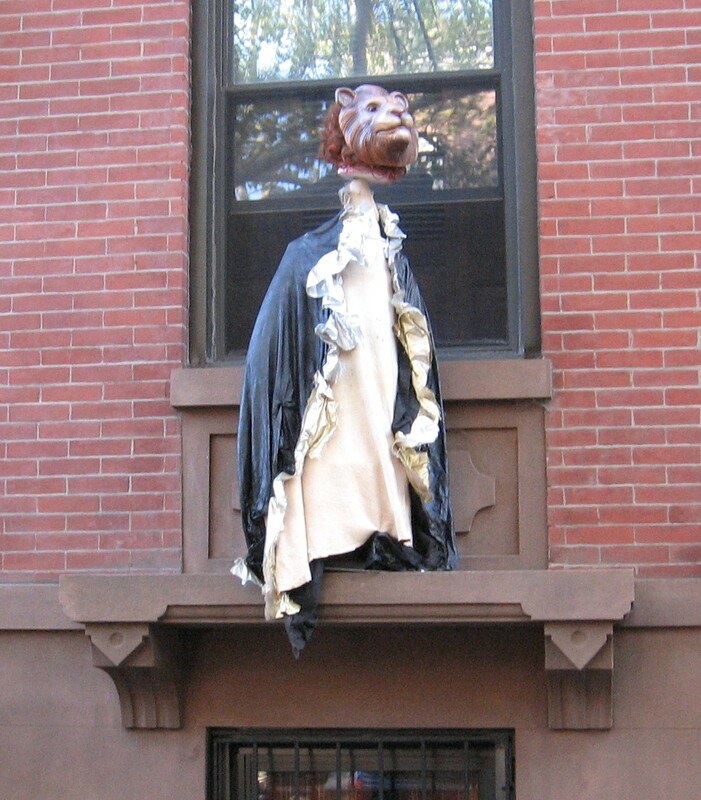 A Cobble Hill tradition, a (nearly) life-size lion returns to a ledge at 368 Clinton Street during August every year. 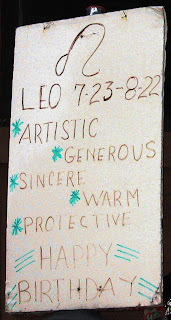 Celebrating all things Leo, the lion is usually accompanied by a sign describing Leos as artistic, generous, sincere, warm and protective. But it was raining when we passed by and the sign was not out. So here it is from a past year. Leo has changes a bit, too. Here's how he looked in 2007. 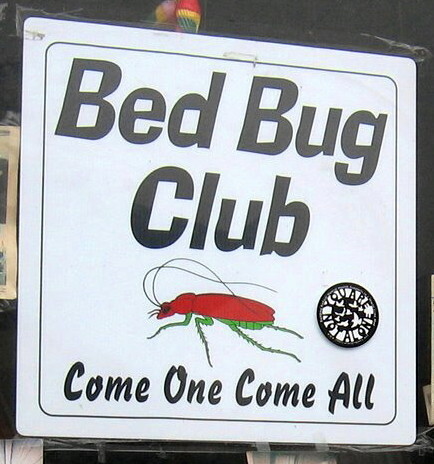 Bed bugs were found on four floors of the Kings County District Attorney’s Office on Jay Street in Downtown Brooklyn Friday, reports the Brooklyn Eagle, and now lawyers at Brooklyn Supreme Court are a wee bit worried that the critters might spread to the courthouse hidden in files and paperwork. We'd be worried, too. If the bugs have already spread to four floors, that's a massive infestation. The Brooklyn D.A.’s office "shares a roof" with the Brooklyn Marriott. But the Marriott told the Eagle that the foul insects "didn’t breach hotel security." 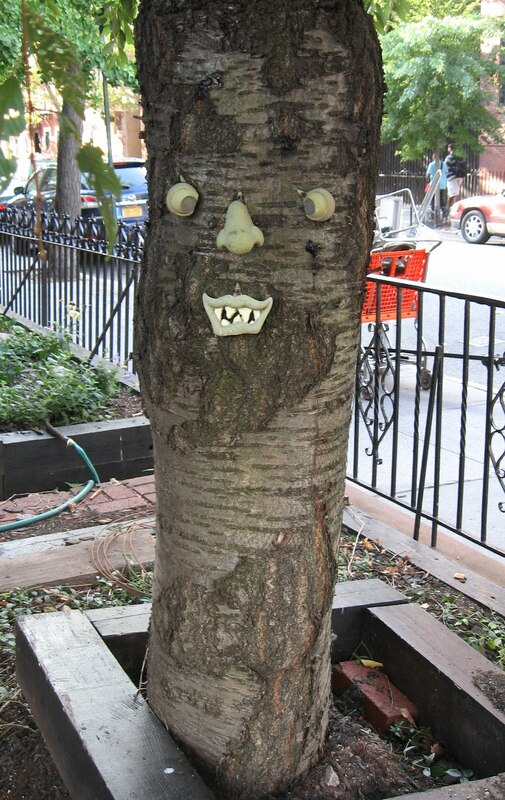 UPDATE: The Above the Law blog has gotten ahold of amusing internal Brooklyn D.A. 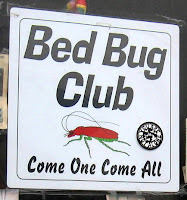 emails about the bed bug crisis. The line in front of Grimaldi's Pizza on Old Fulton Street in DUMBO now extends all the way to Pete's Downtown restaurant at the end of the block. Cars cruise slowly by, causing traffic backups, and tourists on tour buses cruising to Fulton Ferry Landing crane their heads to look at the circus. 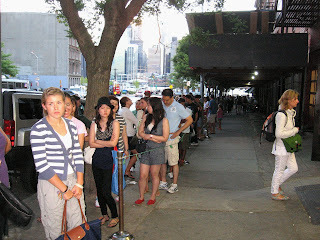 The ridiculous lines are expected to keep up until November, 2011, when Grimaldi's lease expires and the whole shooting match will be shut down. The owner of the building housing Grimaldi's was ordered by a judge Friday to accept late rent payments and allow the restaurant to stay open, according to the Brooklyn Paper, in spite of a 2008 contract stipulating that Grimaldi’s would be evicted if its owner was ever late on payments again. 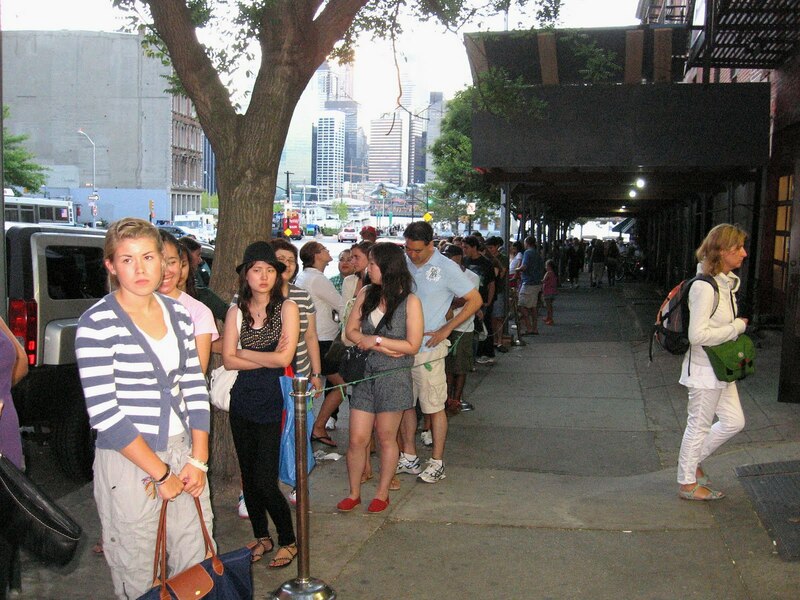 Meanwhile, some customers are dismayed to find that Grimaldi's doesn't accept credit cards. Instead, staff members point to an ATM Grimaldi's placed right outside -- where the fee is $4.50 a swipe. It's funny how sometimes you can see faces in clouds or, in this case, a tree on Clinton Street at Sackett in Carroll Gardens, Brooklyn. 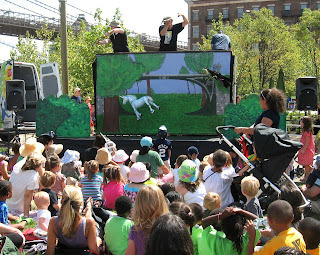 A crowd of kids and caregivers enjoyed an updated production of “Sleeping Beauty,” put on by the City Parks Foundation PuppetMobile in Brooklyn Bridge Park this past Friday. This version of the story had multiple suitors, a unicorn (above) various magic figures and a skeleton. 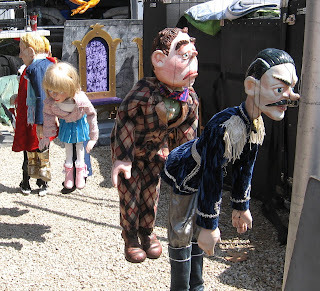 Here are some cast members, backstage. The two guys on the right are the losing suitors. A steady stream of customers flowed into the new Crumbs bakery at 109 Montague Street in Brooklyn Heights Thursday afternoon and evening. The cute little bakery features both big, elaborately decorated cupcakes and "classic" cupcakes (the size all cupcakes used to be before America became supersized), plus oversized cookies, coffee, etc. The coffee is free with every purchase for a couple of weeks. 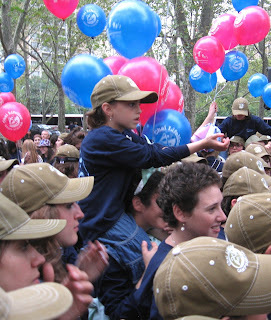 1,000 cupcakes will be given away at the Brooklyn Heights store this Saturday, according to the Brooklyn Heights Blog. Ring? Check. Something blue? Check. 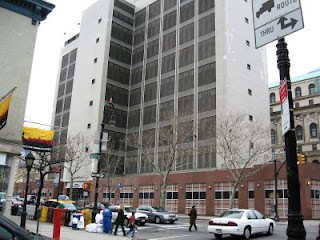 Prisoners, along with white prison buses, police cars, prison personnel and prison visitors will soon be back in force at Brooklyn's House of Detention on Atlantic Avenue in Downtown Brooklyn. In spite of community opposition, Wednesday the city Department of Correction announced that the Big House's new plan would include “full utilization" of its 759 beds. Various schemes (see below) to vastly expand the House of D, build retail on the ground floor, add a protective outer layer of co-ops, turn it into a hotel or install a school in the building have been dropped, however. Whew! Stories at the New York Times and the Brooklyn Eagle. 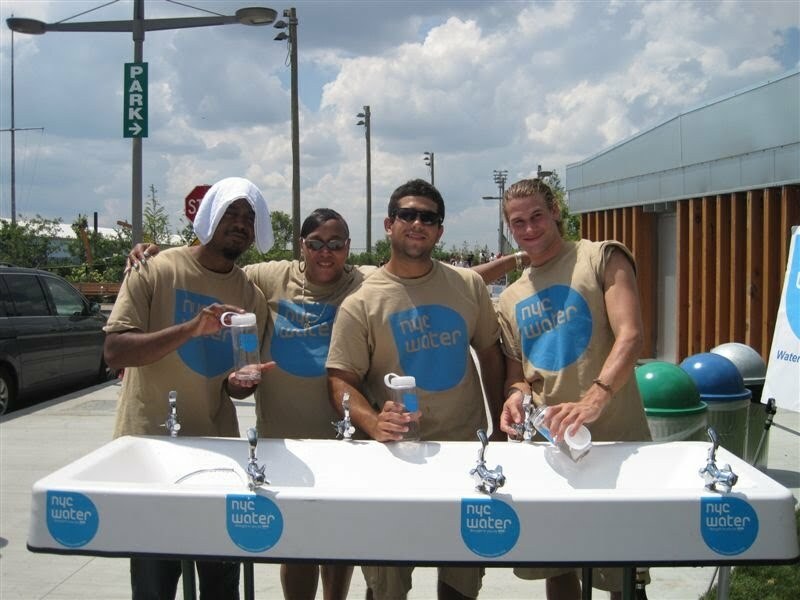 The Department of Environmental Protection is partnering with City agencies and other local organizations to help New Yorkers stay hydrated and healthy this summer by setting up NYC Water-On-the-Go fountains at public plazas, greenmarkets, parks, and special events. Beginning this Wednesday, August 11th, and every Wednesday through Labor Day, the MetroTech fountain will be located at Willoughby Plaza – on Willoughby Street between Pearl and Adams Streets. Perseid Meteor Shower: Catch It Tonight! The annual Perseid meteor shower starts tonight -- technically Thursday, August 12 in the a.m., since you won't be able to see much till after midnight. While the meteor show will also be going on August 13 during the wee hours, Weather Underground predicts a goodly chance of rain, so if you want to see shooting stars, go out after midnight tonight to an area as free from light as you can. Bring a blanket or lawn chair and point your nose straight up. According to Earthsky: "These typically fast and bright meteors radiate from a point in the constellation Perseus the Hero. But you don’t need to know Perseus to watch the shower. The meteors appear in all parts of the sky."